Who are we? … We’re “The Whitehouse Boarding Kennels and Cattery”! We’re now well into our second year of operating as a boarding kennels. And a very busy time it’s been. We’d like to thank all our customers and their dogs for their custom and support. We hope you’ve been happy with what we have to offer. We’ve certainly enjoyed meeting lots of new people and caring for such a wide variety of dogs. It’s been amazing to see so many different breeds and especially their differing personalities. In fact, we’ve been so busy that we’ve extended our kennel block. This second phase has doubled our kennelling capacity and these new runs are available now. 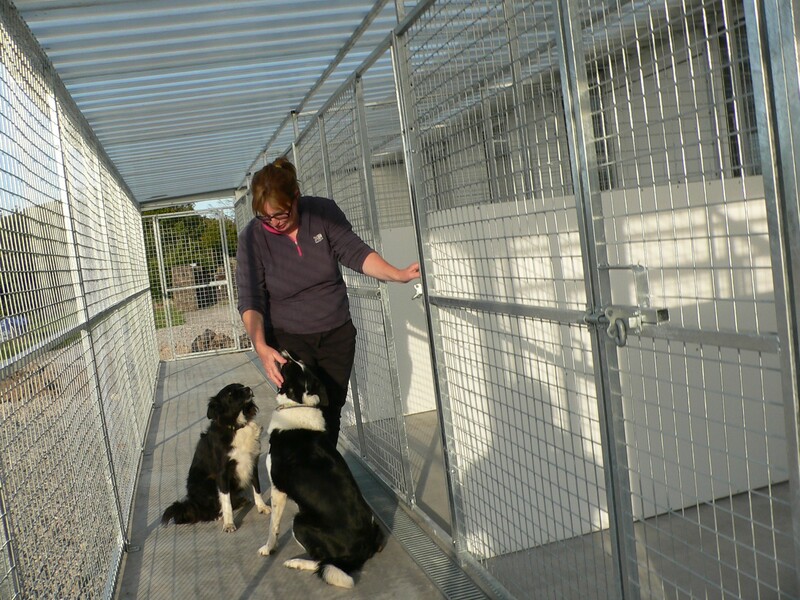 The new kennels are of the same general design as our existing runs as these have proved to be so easy to manage and seem to be popular. 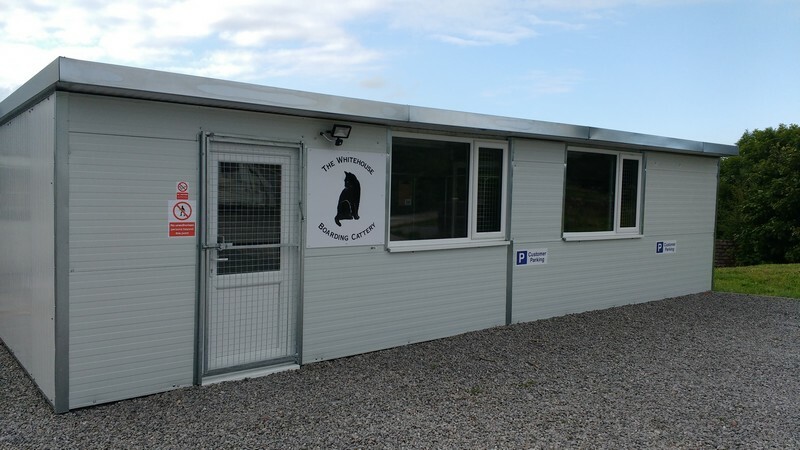 We have a total of 24 modern kennels, each with a spacious indoor sleeping area and a hatch leading to a larger, covered outdoor run. We also have some bigger family units for when there’s more than a single dog in the household and you’d prefer them to share an accommodation unit. 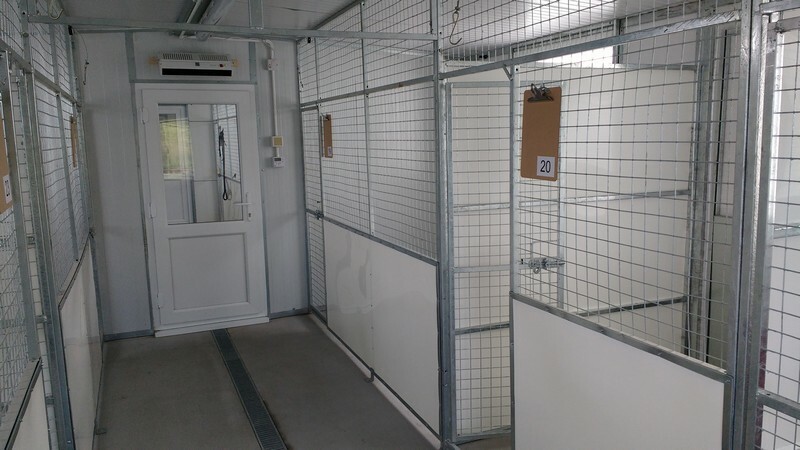 We’ve designed the newer kennels in line with the recently issued “Model Licence Conditions and Guidance for Dog Boardng Establishments 2016”. Our new large dog kennels have 6 sq.m. of exercise space in the covered outdoor run. Each dog has free access to its own outside area during the day (apart from when we’re cleaning). Notice how the partitions between the kennels, known as sneeze barriers, are full height, floor to roof. This is one of the newly introduced recommendations to prevent cross-contamination. Inside, a central corridor provides access to the sleeping areas. Here you see another of the new requirements we’ve incorporated: panels which allow the dogs to hide from their neighbours across the way if that’s what they want or they can go to the gate and see what’s going on. It’s their choice. Each and every kennel run has its own doubleglazed window helping to make the kennels bright and full of light. The electrical sockets and the lights are all water resistant, so we can hose down when we need to. 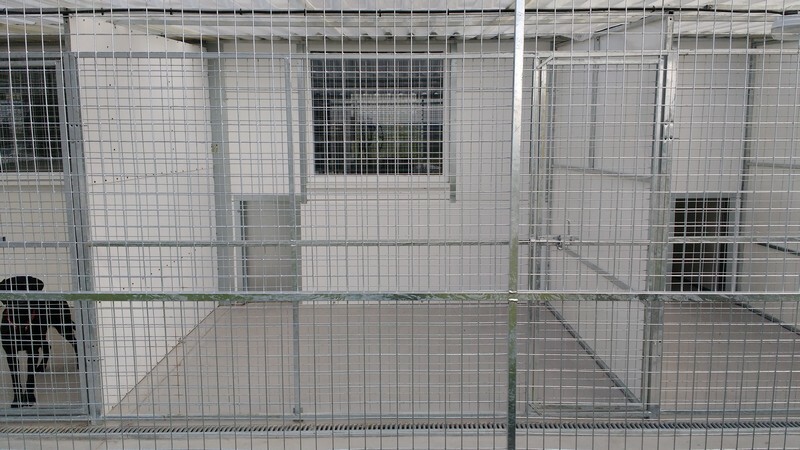 The need to keep the place clean and hygenic was key to the kennels’ design. Where are we up to with that cattery? In addition to all the dedicated cat people out there we know that a lot of our potential customers have both cats and dogs. We understand you would prefer to board your pets at a single establishment, so we’ve added a cattery to The Whitehouse and it’s open for bookings. Like the kennels it is built from fire resistant, insulated panels for both the walls and the roof. The windows are all double glazed. 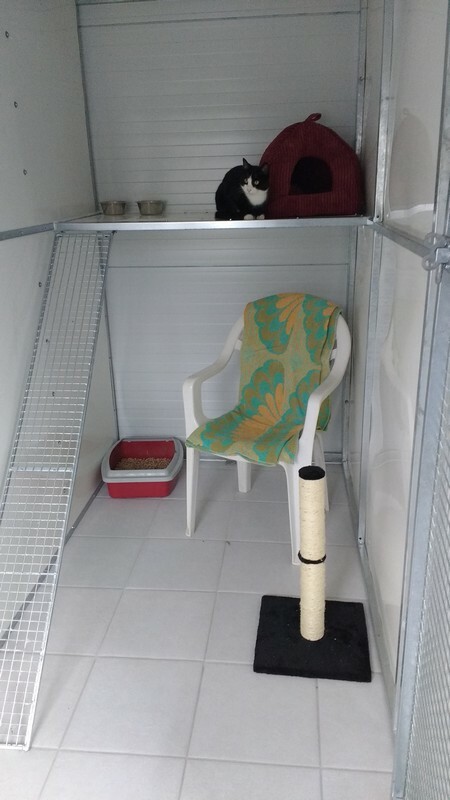 These building materials will help keep the cattery warm in winter and cool in summer as well reducing noise so your pets can have a peaceful stay. Our cattery is heated and has provision for heated cat beds. Each standard cat pen is 32 sq.ft. (3 sq.m.) and we have a larger pen of 40 sq.ft. for a family of cats. Each pen has a sleeping shelf which can be accessed by a ramp (if your cats aren’t up to jumping). The photograph shows Mog, our mouser, trying out one of the cat pens for size. Notice how all the surfaces can be properly cleaned: no wood or blockwork here (another of the recommendations, but quite a longstanding one). So, who’s going to be running the kennels and cattery? The business is owned and run by Lucy Scott with occasional hindrance from her own dogs (Guin and Pen) and from Mog (yes, you guessed it – the cat). Lucy isn’t new to the pet boarding industry, although this is the first time she’s owned her own establishment. 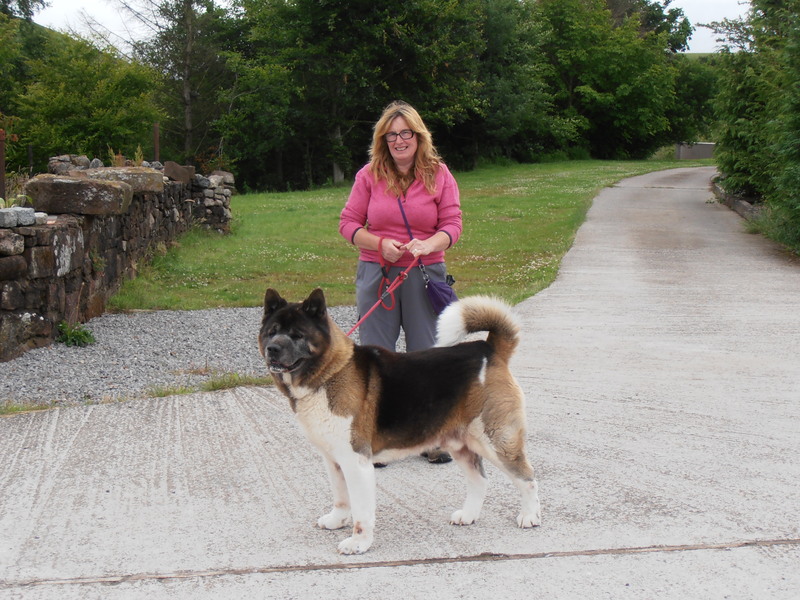 Previously, she spent several years working at, and at times managing, a large and very successful kennels, cattery and livery stables in Lancashire. She has a love of both dogs and cats, something you can tell from some of the reviews left by our customers. So, why not pay us a visit? You’re welcome to come and have a chat with us and to see our pet accommodation before you make a booking. Give us a call. We think you’ll like our purpose built, clean and modern facilities. We very much like to think you’ll trust us to look after your much loved animal companions with all the care and love they deserve.